There are more than 100 schools in the US that offer prime education programs for international students. With so many choices, it is important to keep in mind certain factors such as cost, size, programs and concentrations when choosing the school that’s right for you. The top schools for education in the US all offer unique and enriching opportunities to help you earn a rewarding education career. It’s time to apply to some of the best schools for education in the US. You have worked hard to get here and are proud of your achievements. You know that the reason you are here is because someone taught you—someone believed in you. This belief helped you achieve every goal, every triumph, every victory, until this moment. Your next goal, which you also intend on accomplishing, is to become that voice, that mentor, that teacher. And you know that with the help from other educators at the top schools for education, you will have the opportunity to educate generations to come. In choosing a college that’s right for you, there is no wrong answer. International students can learn from more than 100 of the best schools for education the US has to offer. The key to finding a college is to know whether you want to teach early childhood education, elementary education, secondary education or adult education, as well as the subjects on which you will want to focus. You should also keep in mind the cost, whether you want to go to a public school or private school, a small, medium or large sized school, and whether or not the school has programs that will benefit you later. Depending on the focus of your education career, certain colleges will stand out. Your focus can include the grade level at which you wish to educate as well as the subject you wish to teach. Education students at Stanford University can focus on homeschooling, religious schools, cultural education and business education. Students at The Pennsylvania State University College of Education can not only concentrate in a specific area, but can also merge departments and create a major that combines education and a fresh area of focus. Michigan State University, arguably one of the best schools for education in the US, offers more than 20 majors from which to choose. MSU has been ranked first in the nation for its elementary and secondary teacher education programs and offers 5-year teacher preparation programs for elementary, secondary and special education teachers. Students studying at the University of Georgia can focus on teaching language to speakers of other languages (TESOL) as well as other language and literacy specializations. The university has been ranked fifth in secondary education and sixth in elementary education by U.S News. International students studying at UGA can also focus on workforce education. 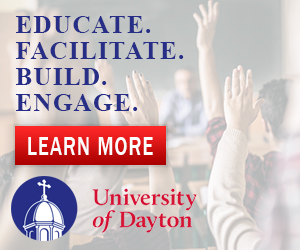 Another school to consider is the University of Dayton as their Department of Education has various nationally ranked programs and degrees. The Early Childhood Education program relies on both experiential and classroom learning, and students will be prepared to teach Pre-K-3rd Grade upon completion. Students have access to a demonstration school at Dayton’s family learning center where they can practice what they’ve learned in the classroom and teach young children. This allows students to observe the effectiveness of their methods and learn from their mistakes, which is crucial in the field of childhood education. Effective teaching relies on the ability to analyze and improve your methods, and the Dayton administration acknowledges this and implements it in its teaching methods. International students looking for more affordable colleges with quality education programs can find that in many of the top schools for education. Most of these schools will be public universities, but do not rule out a private college because of price, as there are many scholarships available in that sector. The University of Minnesota costs approximately $6,000 a semester for residents and $8,500 for non-residents. International students who study at this university will go beyond the scope of education and learn about social sciences as well. Residents attending the University of Washington pay roughly $12,000 and non-residents pay about $30,000. The education that students receive at this university is well worth the cost of tuition. At this university, international students will begin teaching in local schools early and will learn about the current education climate and the adversity facing students today. Like the University of Washington, Ohio University also focuses on solving social issues that thwart educational success. Students will pay approximately $10,000 for in-state tuition, and $18,000 dollars for out of state students. The best schools for education in the US all have unique programs that will help their students thrive and learn how to be life-changing teachers in a time where education in America is in a constant struggle. At Connecticut College, students complete a student teaching program to help students understand current American education. The University of Minnesota’s College of Education and Human Development	attracts many international students due to its focus on multiculturalism and diversity in education. Their program entitled DirecTrack to Teaching offers focused education training which prepares students to achieve their teaching license. Felician College allows international students to begin student teaching in their first year and provides other hands-on learning experience for their students. Learn more about studying education in the USA by reading our growing article collection. « Study Guide by Subject	« Study Education in the U.S.